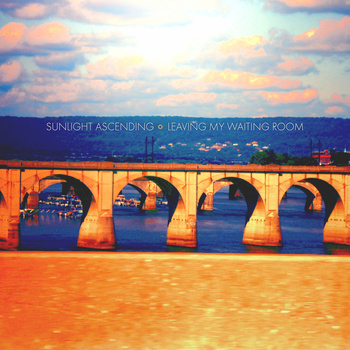 Clawson, Michigan based band, Sunlight Ascending, release their 4th album in as many years and it is called Leaving My Waiting Room. The album hit right at the end of 2012 and probably missed a lot of ‘best of’ lists, and while I am not a big list person I am sure this album would have featured on a few peoples top 10’s. This is a top class album, kicking off with the intro track ‘Reductio Ad Absurdum’ a short piece prior to hitting it up with ‘The Dhanbad Rails’ and they hit it up big on this track, great drum intro to this track leading into bass then guitar riffs, nice melody throughout with subtle shifts in tempo which occur frequently. We then move on to Vladdie which has a more acoustic feel to it, an altogether more quiet track all round. Track 4, “Gleaming Apollo’ has a more experimental feel about it, no real melody to speak off, I think it is processed guitar sounds with a great beat in the background. Its a very dark track, and the music is not in the forefront, it is as if it has been supressed somehow, a really nice sound though. So there is a wide variation of sounds just within these opening 4 tracks, and there are still another 8 to go. My favourite track has to be ‘They’re Lonlier On The Outside’, and that is immediately followed by a signature track called ‘Kalkaska’ which has the Sunlight Ascending sound all over it. So a really strong release for the end of 2012 and is Fade To Yellow 2nd album of the week in 2013. Go check it out, its a beauty. This entry was posted on January 17, 2013, 9:08 pm and is filed under Playlists. You can follow any responses to this entry through RSS 2.0. You can leave a response, or trackback from your own site.